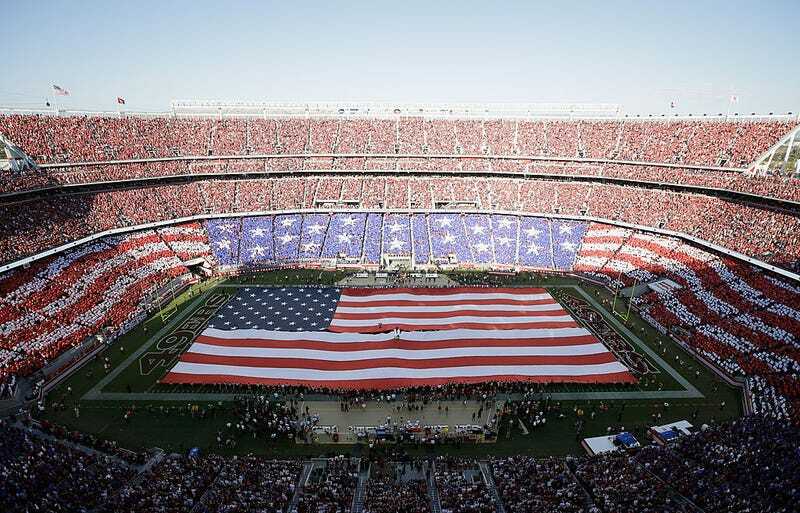 A general view during the singing of the national anthem before the game between the San Francisco 49ers and the Chicago Bears at Levi’s Stadium on Sept. 14, 2014, in Santa Clara, Calif.
… still stand up for your national anthem and pledge allegiance to your nation’s flag. Perhaps I’m old-school. Some who read this will, predictably, suspect that it even makes me less black. (Been there. Heard that. Shoulder brushed, keep moving.) Yet San Francisco 49er Colin Kaepernick’s strangely abrupt, we-didn’t-know-he-had-it-in-him rebuke of the national anthem suddenly opened up a floodgate of confessions that, apparently, reveal that citizens of color dissing unifying national symbols is a thing. Unofficial group peer pressure is now in effect; look to your brethren or sistren beside you at the next sporting event and watch sweat roll down their faces as they fight every urge to stand or land right hand to chest. Certainly, I’m all good with Kaepernick’s exercising his right to refuse it. But this is not the iconic 1968 black fist pump in Mexico or Jackie Robinson entering the majors. In those moments, black athletes presented the black power fist as a political alternative, whereas it’s unclear that Kaepernick has one. Even Robinson, during that time, used his protest as a shield against the onslaught of open racism as he played. And it’s not as if Kaepernick is saying, “Hey, screw this flag, but I am going to help ColorOfChange.org PAC meet its $3.5 million fundraising goal this year so they can unseat racist prosecutors.” Nope. Black athletes and celebrities make a lot of noise on Twitter and wear T-shirts to piss people off, but few put their money where black people really need it. Yet despite his eye-popping $114 million ($61 million guaranteed) six-year deal to play the greatest of all American inventions, Kaepernick still engages in a unique and imperfect form of patriotism. The idea that flag-loving fans should take a public tree switch to him for doing so is hypocritical: Why blast him for deploying a constitutional right in defense of symbols representing said constitutional right? This debate, however, won’t preclude my right to believe that Kaepernick and his flag-shading supporters are a bit misguided in this anthem-bashing moment. I get why. I also understand the complete context of where it’s coming from. Still, whether we like it or not (and there are many days when I’m not liking it, either), America is our collective home team. Acknowledging these symbols won’t mean you’re endorsing ugly, government-sanctioned vicissitudes. These national customs weren’t created as sign-on-the-dotted-signature-lines for past, present and future national misdeeds. But they are identifiers for a promising ideal that we all aspire to in our protests, our movements and our campaigns, and the way in which—I assume—we’re awkwardly wed together in our pursuit of a common good. Even as we bump through dark nights as a nation, the vast majority of us do so looking to a better quality of life for ourselves, our children and their children after them. We all need home teams, even when home occasionally … well, OK, frequently … lowers its own standards. But saluting the flag or pledging allegiance to it won’t diminish your passion to correct it. Nor is that flag necessarily an official trademark of crimes against humanity, despite the fact that many have used it for that purpose. That flag, that national anthem and that pledge not only are what they mean to you as an individual but also signify the need to rise to a common national bond. Flags and lofty democratic ideals, albeit symbolic, are supposed to act as reminders of that. They are one of those rare, tattered, national rallying points when disaster strikes or when our humanity has no choice but to transcend everything else. There’s no political reason that I still salute the flag and pledge allegiance to these United States of America. It’s just respect. As a quiet military-history geek, I reserve profound appreciation for the many people of all stripes and persuasions who died for that flag. They fought some wars that were obviously very just (where would we be without the Civil War and World War II?) and, yeah, fought some that weren’t (and look where we ended up after Iraq). But still, anyone willing enough to take on the horror of war in my stead gets a nod of respect. Many black soldiers fought those good wars under it, too, either taking out Confederate soldiers or shooting down Nazi planes or, yes, marching for civil rights. We all cohabitate in a diverse society where we must—at different points—reconcile and resolve our differences. Part of that involves a dramatic change in how we interact, how institutions treat us and how we govern. That’s never a perfect process. But all conflicts must have an end game. In these tense times, we need one that illustrates what a better America can be. Picking this particular battle doesn’t strike me as a good way to get us there any sooner. On the path to an end game, some ugly compromising will take place. That’s the price of admission, kind of like jury duty: We don’t like doing it, but we have to do it. Without national glue, every block, every coffee shop and neighborhood park, falls apart. And we don’t want to imagine what that looks like.